Ed Wolpov sent in an entry for our RAW contest #21 "LightZone contest #1". Even if all our readers can see all editing steps that were performed by Ed it seemed to be nice to also understand the motivation for all editing operations. We thank Ed Wolpov a lot that he wrote down his personal ideas while editing this picture (the picture is ©Bettina + Uwe Steinmueller). The rest of the text is by Ed Wolpov. I'm always amazed at the ease and infinite variety of intuitive options I have at my disposal when I modify photos in LightZone. Instead of trying to decipher numbers, curves, levels, and histograms as I would in Photoshop, LightZone allows me to work in a more visual, natural-feeling environment – much like I did in the darkroom. Before beginning a project, I take a few moments to look over the original image and plan out a course of action. In the original photo I see a number of things that appeal to my aesthetic senses. 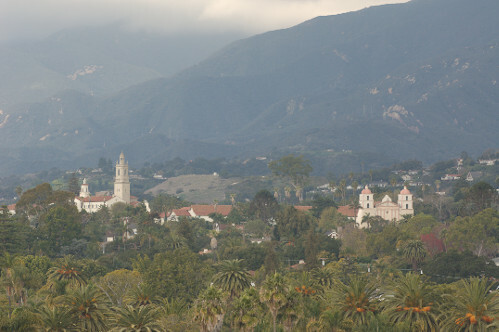 There's the foreground foliage, the two large buildings, the near mountain range, the receding mountains, and the clouds/haze. All of these areas can easily be worked on independently if I wish, but what I actually do is the result of an iterative process… things will develop as the image takes shape. I often start by applying a mid-tone contrast enhancement layer. 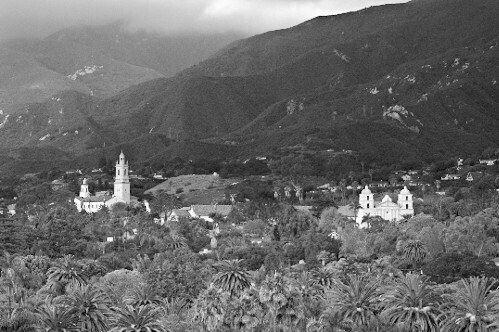 I do this by adding a Sharpness layer across the entire image (re-labeled as Midtone Contrast). By setting the Amount to a value of 20 and the Radius to 50, the depth of the lower mid-tones is increased without actually affecting the sharpness. This technique works equally as well in Photoshop through the use of the Unsharp Mask filter. The values given above are just a starting point, so feel free to experiment… just remember that the relatively large Radius amount is what makes this technique work. 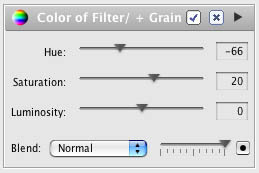 You'll note that this technique has no effect on the upper mid-tones or highlights. My second layer is almost always an adjustment to the shadows. By adding a ZoneMapper layer (I call it, Shadow Adjustment) and running the cursor through the lower zones of the step-wedge, the ZoneFinder's yellow highlight shows the first area representing the lowest (darkest) zone. I then move to the next lower zone in the ZoneMapper and pull it down to the bottom. This brings the lowest zone to the bottom of the scale and spreads out the remaining tones above it. Looking at the results in the image window, I see an increase in depth to the entire photo. I've pretty much got my foundation looking the way I envisioned; now I can concentrate on the mid-tones and highlights. In this case I'll add another ZoneMapper (Mid-Highlight Balance) and adjust the mid-tones and highlights by pulling down various zones to help balance the near mountain range, the receding mountains, and the clouds/haze. 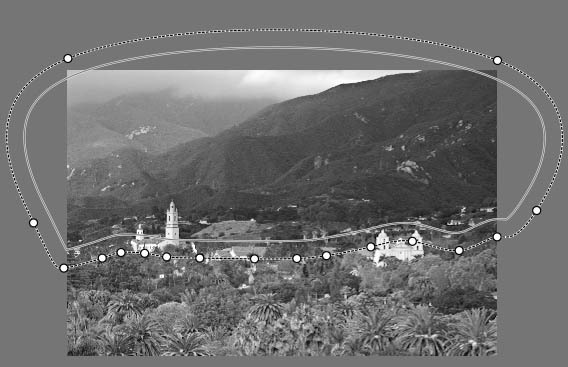 In order to affect only the upper portion of the photo to confine my adjustments, I first set a Region with a moderately wide "feather" around the area of interest. Satisfied with the way things are progressing, it looks like I can finish up by adding a Sharpen layer across the entire photo. My settings are an Amount of 121 with a Radius of 1.8. This gives me a modest amount of sharpening without going overboard. Done. Well, not quite. Spending a little time looking at the "final" image, I ask myself if there's anything I can do to improve the feel or mood of the shot. Maybe a little more saturation and a bit more luminosity would do it some justice, so I add a Hue/Saturation layer and pump things up until it looks "right." Okay, just one more tweak, the color is just a little too warm for me. The whites are not cool enough, and the distant mountains could be bluer. 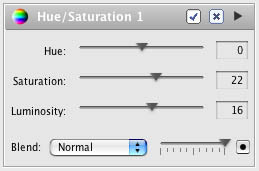 I add a White Balance layer and adjust the temperature until I feel comfortable with the overall color. That's it, much better! Back in the days of yore, when I spent my weekends in the darkroom (remember the darkroom? ), I would often do a little edge burning or corner burning to a print in order to surreptitiously bring the viewer's attention to the main theme of the photograph. To do this in LightZone, I first add another ZoneMapper (and call it Darken Corners). Then all I have to do is select an oval-shaped region over the entire image with the Region tool, invert my selection, and drag out the feather to smoothly blend the effect. 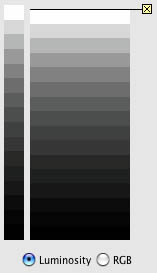 By selecting the highest (lightest) zone and dragging it down slightly, I'm able to darken the corners. A little goes a long way; so I darken until it's just barely noticeable, then back off a bit. Just when I thought this version would be my entry into Outback Photo's Contest #021, I realized that I'd probably have a better chance of being unique if the image was in black & white. Back to the drawing board! 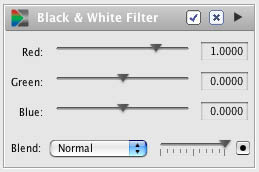 In order to accomplish my black & white conversion, I use a technique of applying two layers; one Channel Mixer layer (I call it Black & White Filter) and one Hue/Saturation layer (called Color of Filter/+ Grain). To use this technique, in the Channel Mixer, I set the red channel to a value of 1.0 and the green and blue channels to 0.0. Now, in combination with the Hue/Saturation layer, as I change the Hue, it acts like a colored filter that allows me to swing through the entire spectrum of colors. By looking at the image and adjusting the hue, I was able to achieve the effect I wanted. Pumping up the saturation increased the intensity of the filter effect and added a grainy look to the image. This rendition of the photo was the one I used to enter into the contest. It was pointed out to me that there were a few areas of pure white in my final image, so it's important to at least do a cursory check of the highlight values. 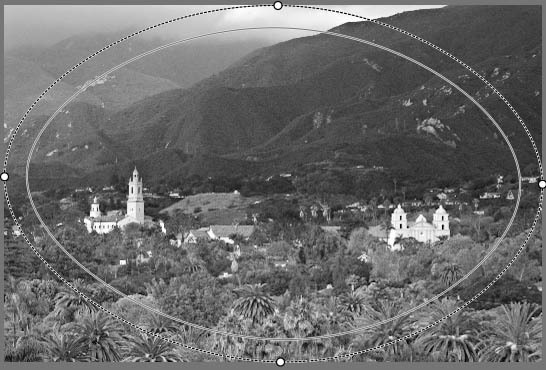 In LightZone, I was able to look at the numeric values in the highlights by entering the Sampler (Command 2 on a Mac) and placing the cursor over the suspected areas. Because the highlights were at a value of 255, they would have printed as pure paper white. By adding a new ZoneMapper (Highlight Touch up) I was able to globally bring down this value to a more respectable 243. I did this by anchoring the second highlight from the top of the step-wedge and slightly dragging down the very top zone until my measured value was 243. Although the steps necessary to accomplish the final photo seem complex, in actual practice it only took me about an hour to complete. The beauty of using LightZone is the ease at which I can quickly make aesthetic judgments on the fly and see the results; much in the same way I would if I had been working on a print in the darkroom. It's a visual, almost tactile way of working!